but also relevant to 1950s & up. Remember the smell of Castrol R at a 1960s scramble? Or riding a 1970s trials bike through every type of natural obstacle possible? If you want to revisit those memories, or relive the competition of earlier times, this book is for you. Buying, restoring, and riding classic off-road competition bikes is now something that you can do! 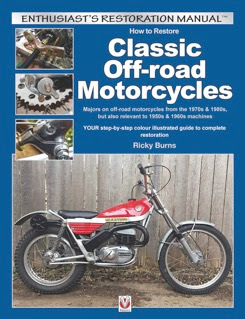 This book gives enthusiasts of classic off-road competition motorcycles a step-by-step guide to a full restoration. Covering dismantling the motorcycle and its components, restoring and sourcing parts, paint spraying, decals and polishing. With chapters covering engine, frame, forks, fuel, exhaust, seat, brakes and tyres, you’ll see how to take a bike from scratch to a full rebuild; then on to safe set-up and general maintenance. Includes chapters focussing specifically on pre-65 and twin shock models.